As an extension to yesterday's post on meditation, I wanted to take a minute to talk about mudras. A mudra is a symbolic hand gesture you can use during meditation. Each mudra has a different purpose. 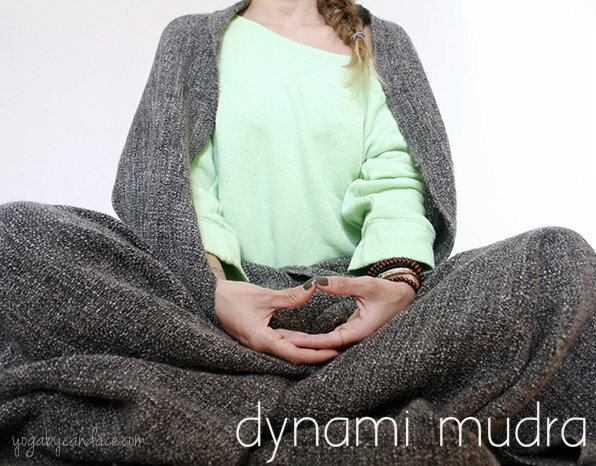 The dynami mudra is when two hands cup each other and the thumbs touch. It is good for centering and balancing. There are conflicting ideas about whether jnana mudra or chin mudra have the hands facing up or down, but I learned it this way and that's what I'll stick to. :) They both symbolize union. Jnana mudra has the hands facing down, signifying that the prana (life energy) is kept inside the body. In chin mudra, the backs of the hands are on the knees which allow excess energy to flow out of the body. The upturned position of the hands has a releasing effect on the breath to promote relaxation. Of course, it's your meditation so you can do whatever works best for you. There are no right or wrong ways to meditate. Just experiment to find what speaks to you.